Winged Creatures opens innocuously enough. In a sleepy diner that looks like something out of the 1950s Midwest, Anne (Dakota Fanning) and her best friend Jimmy (Josh Hutcherson) are having breakfast with Anne’s father. Overstretched waitress Carla (Kate Beckinsale) alternates between a telephone conversation with her young child and pouring coffee for hangdog driving-school instructor Charlie (Forest Whitaker). Clean cut doctor Bruce (Guy Pearce) steps in to get his morning caffeine fix, and holds the door open for an anonymous looking stranger as he exits. The stranger thanks Bruce, then moments later takes out a gun and starts shooting in a terrifying burst of random violence. Aside from a brief glimpse as he enters the diner we never really see the killer’s face. The camera instead prefers to focus on the firearm, or the haunted reactions of those involved, as the faceless shooter goes on his senseless rampage before turning the gun on himself. Anne and Jimmy take refuge under a table and are spared. Carla likewise escapes unharmed. Anne’s father and several other patrons, however, are not so lucky. Charlie takes a bullet to the neck and is rushed to hospital, as is the heavily traumatised Jimmy. Quickly given the all-clear, Charlie checks himself out and promptly decides to celebrate his good fortune with a bout of gambling. Carla prefers not to talk about the incident, instead focusing her energies on her beloved son, and Bruce attempts to assure his wife he is not unduly upset about his brush with fate, busying himself with his professional responsibilities. 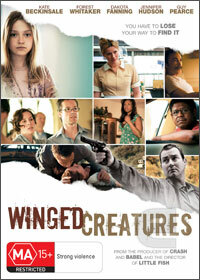 Based on the excellent novel by Roy Freirich, who also wrote the film’s screenplay, Winged Creatures unites its principle characters in tragedy in a way that never feels contrived. It is the first Hollywood outing for Aussie director Rowan Woods, whose two previous films The Boys and Little Fish won him a strong critical reception in his homeland, and is a fine showing of his cinematic talents. The tension builds to fever pitch in places, and the excellent ensemble cast ensure the heavy subject matter steers clear of melodrama. Beckinsale is subtly radiant as the angelic Carla, and perfectly conveys a sense of longing for the handsome Bruce, portrayed to perfection by the always-brilliant Pearce, who further cements his position as one of the finest actors of his generation. Whitaker puts in a solid performance as the recovering gambling addict giddy with a newfound sense of respect for his time on earth, and both Fanning and Hutcherson are eminently believable as the youngsters struggling to come to terms with the mindless slaughter they’ve witnessed. Not the most light-hearted of fare, Winged Creatures nonetheless features some astonishing performances and remains a gently executed celebration of life.